This project involved reduction and relocation of the existing kitchen plus repositioning of the main entrance and offices in order to give the school a central hall. The hall has a library/reading area and enabled a baby changing room and milk room to be attached to the new baby classroom. 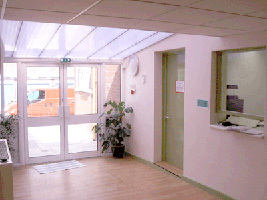 Relocation of the kitchen, main entrance and offices enabled the level of security to be improved by forming a controlled single point entrance and giving increased visibility from the reception office through to the new central hall and classrooms. Repositioning of the main entrance required the relocation of the first floor tenants access steps to a side alleyway, which provided the tenants with a separate entrance rather than shared, as previously. All toilets and classrooms were refurbished and laundry facilities were formed from an existing pram store to accommodate the increased number of children. This was due to gaining an additional classroom from the changes and relocation of the staff room.